Albatross spend most of their lives in flight. They forage in the open ocean, where food may be separated by many miles, and they head for islands only to breed. They have been documented making around-the-world trips in just 46 days (take that, Jules Verne!) and flying for weeks at an average speed of 950 km per day (Croxall et al. 2005). That’s 40 km per hour, so you could beat them in a car (if you could stay awake that long), but still! How can an animal spend so much time in such fast flight? How do albatross not waste away and die from the sheer energetic effort? They have some tricks. One is physical: imagine holding your arms outstretched for weeks—it would be awful, right? Birds are built for outstretched forelimbs better than we are, but even so, the strain of simply holding out their wings for that long should be a problem for albatross. The solution? They have a “shoulder lock,” a rigid tendon that acts as a strut to passively prop up their wings. They also have a lot of slow fibers in their wing muscles, meaning that those muscles are good at sustained activity (Meyers & Stakebake 2005). I could do this all year. Hawks and vultures are great gliders too, but they get to use the rising hot air of thermals to keep them aloft. 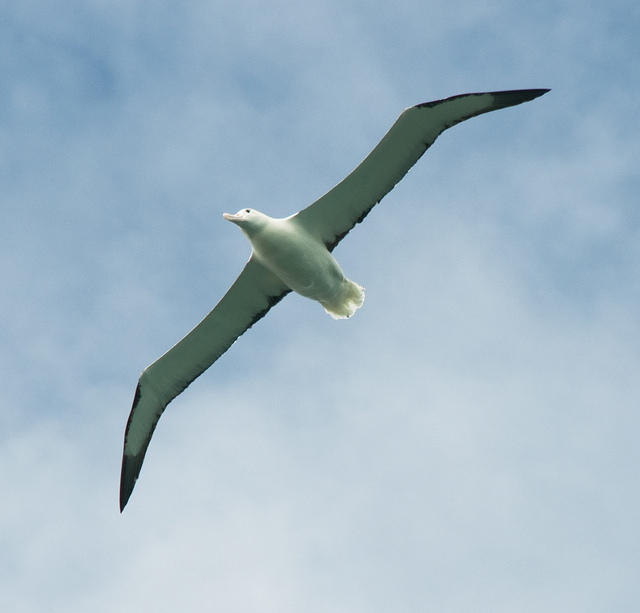 There aren’t many thermals on the open ocean, so albatross use a strategy called “dynamic soaring,” which lets them glide potentially endlessly while theoretically expending no energy. Dynamic soaring takes advantage of the fact that wind near the water’s surface is slowed down by friction with the water, and wind a little higher than that is slowed down by the slower wind below it, and so on; so there is an increase in wind speed as you move higher from the water. This is represented by the black arrows in the diagram below: longer arrows mean faster wind. Dynamic soaring diagram. Apologies for the roughness; portraying 3D phenomena in a 2D Powerpoint slide is not my strong suit. At point (1) on the diagram, the albatross is near the water’s surface and flying towards the wind and upward. It’s losing speed, since it’s flying into the wind. However, once it gets high enough that the wind is quite fast (2), it turns around and goes with the wind as far as the energy of that fast wind can take it, gradually falling back towards the water (3). When it gets low again, it turns toward the wind, and the cycle repeats. The albatross loses speed when it goes up into the wind, but it gains even more speed than it lost when it turns and glides with the wind – just enough extra gain to compensate for drag, friction with the air that slows down all flying things. That extra speed is possible because the albatross mostly goes toward the wind when it’s low, where the wind is slow, and mostly goes with the wind when it’s high and the wind is fast (Sachs et al. 2012). 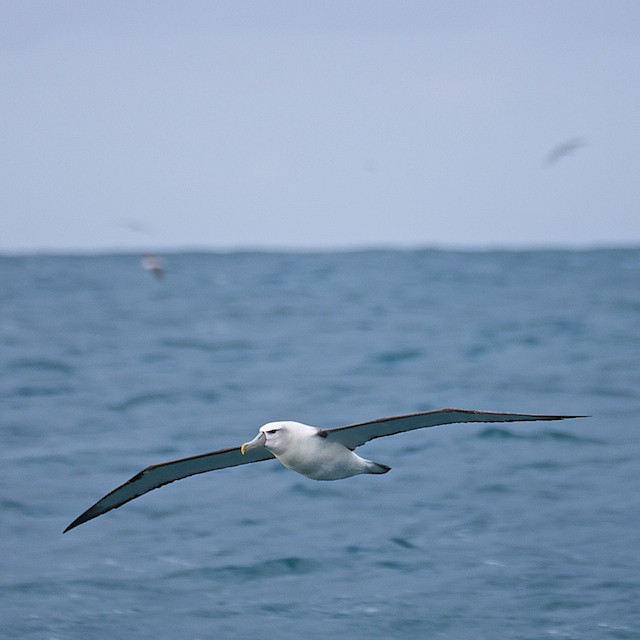 In addition to dynamic soaring, albatross may also use variations in the wind around waves to get extra little bursts of energy (Pennycuick 2002). Albatross in flight with favorable winds use up “little more energy than birds resting on land” (Weimerskirch et al. 2000). Again, the point is that I am awesome at this. Flying out in the open ocean can be challenging. 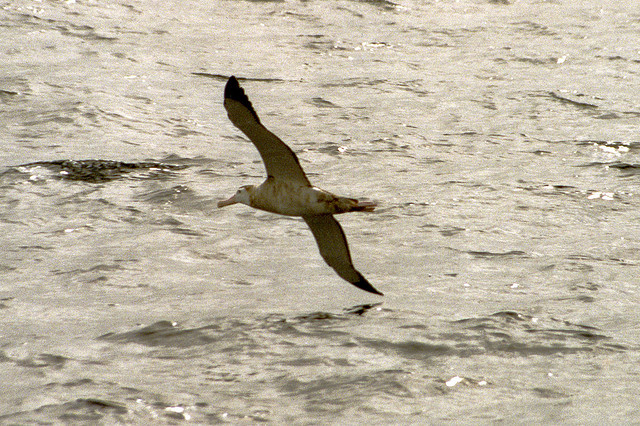 In March 2003, a Gray-headed Albatross fitted with a GSP locator flew into an Antarctic storm. For nine hours, thanks to high tailwinds from the storm, it flew at 127 km/hr (79 mph)—and continued to capture prey at the same rate it would have under normal weather conditions (Catry et al. 2004). Albatross may do funny dances and look less than dignified when they are young, but they perform amazing feats of flight as a matter of daily life. I look like this and I am still awesome. Catry P et al. 2004. Sustained fast travel by a Gray-headed Albatross (Thalassarche chrysostoma) riding an Antarctic Storm. The Auk 121(4):1208-1213. Croxall JP et al. 2005. Global circumnavigations: tracking year-round ranges of nonbreeding albatrosses. Science 307:249-250. Meyers RA, Stakebake EF. 2005. Anatomy and histochemistry of spread-wing posture in birds. 3. Immunohistochemistry of flight muscles and the “shoulder lock” in albatrosses. Journal of Morphology 263:12-29. Pennycuick CJ. 2002. 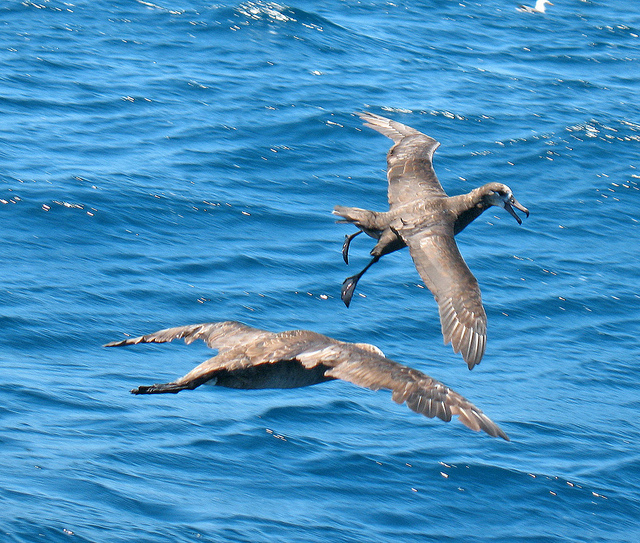 Gust soaring as a basis for the flight of petrels and albatrosses (Procellariiformes). Avian Science 2(1):1-12. Weimerskirch H et al. 2000. Fast and fuel efficient? Optimal use of wind by flying albatrosses. Proc. Roy. Soc. B 267(1869-1874). This entry was posted in avian flight, general science-y stuff, other people's research and tagged albatross, biology, birds, flight, science by toughlittlebirds. Bookmark the permalink. 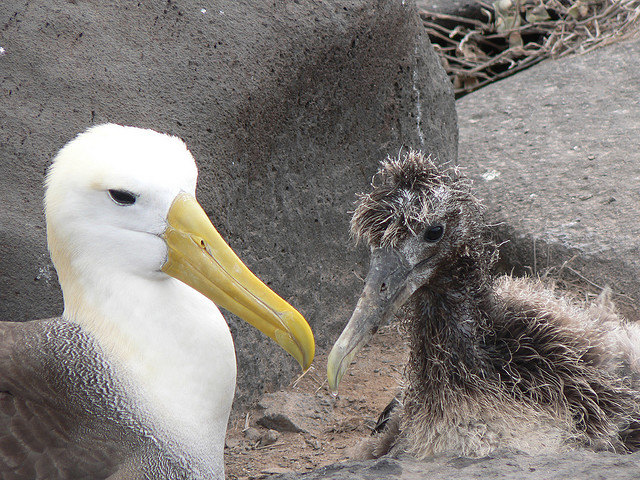 I wonder if juvenile albatross look so scruffy so they’ll appear un-tasty? (But adorable). Nicely done post…informative with a light touch. And great photos! That chick certainly doesn’t look too appetizing! I doubt a predator would be deterred by that though; I’d guess the chick plumage is more camouflage- or thermoregulation-driven. It is interesting how many seabirds are fuzzy grey as chicks – I’ll have to see if anyone is studying why that is. From what I can tell from pictures, it looks like all albatross simply fold the feet back, but it seems to vary by species whether they then stick out past the tail (as in the Black-footed Albatross photo I just added to the post), rest visibly underneath the tail, or simply disappear. I assume the disappeared feet are actually hidden under the body feathers, but it is kind of amazing that the big feet can vanish like that! I could see thinking that they had no feet. They wouldn’t need them if they didn’t have to land to breed – they could just fly forever. I really like to take pictures of birds in flight. Unfortunately, it is usually very difficult. However, I find that sea birds are a bit easier since they don’t move as quickly since they are conserving energy. Great Post! Amazing information. Thanks for all that. I wonder what energy is required though for the brain work needed to use those air currents efficiently. Neural activity is energy hungry. You’re completely right: dynamic soaring is potentially “*mechanically* energy neutral,” – they’re leaving out any energetic cost of the mental activity involved. One paper has hypothesized too that the albatross need to be able to sense very slight variations in air pressure, which would be even more brain work to perceive and analyze. There is no free lunch, or free locomotion. Those periods of exertion do have a tremendous impact on their bodies. It is amazing to read some of the papers done in this area. I really enjoyed your photos and information. Such a wonderful post, with fantastic information. I remember seeing one on the island on which I was raised – nothing more than a rock in the middle of the South Pacific, really. Biggest land mass was 6 hours by plane. Seeing these birds FLY, those wings… Just amazing. Pure beauty. Whether or not dynamic soaring is actually a ‘free lunch’, I’d love to find the equivalent for human life! Truly inspirational creatures. I hope to see some one day, even though it’s a tall order in the North-East Atlantic.